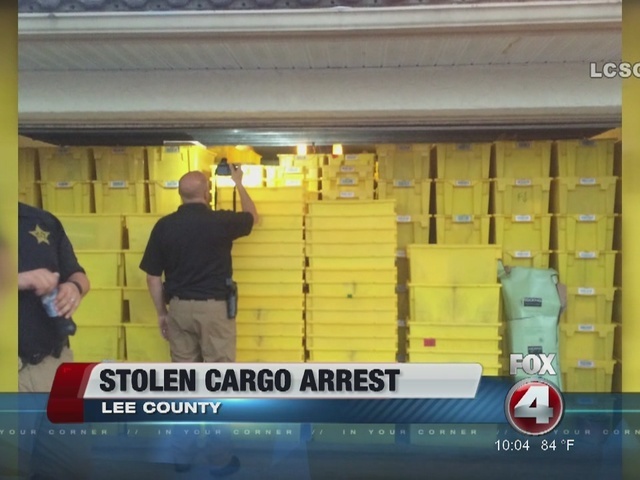 LEE COUNTY, Fla. -- Investigators with the Lee County (Fla.) Sheriff's Office discovered a garage packed full with thousands of stolen Amazon.com orders while serving a search warrant Friday. According to the office, an investigation involving several specialty units began back in early July upon hearing that a stolen load of cargo that was brought into the area. The cargo belonged to Amazon.com and value was estimated to be $121,000. After working with corporate security investigators from JB Hunt Security, LCSO Auto Theft Detectives determined this load was possibly still in the area. The suspect attempted to extort additional funds from JB Hunt during this process. A search warrant was served Friday at the suspect's home. The stolen merchandise, which was compiled of single orders from several thousand Amazon.com customers, was later located in the garage, which was was literally stacked floor-to-ceiling with Amazon containers. The suspect, 36-year-old Julio Hernandez, a driver for a subcontracted transport company, was charged with one count of Cargo Theft and one count of Extortion.